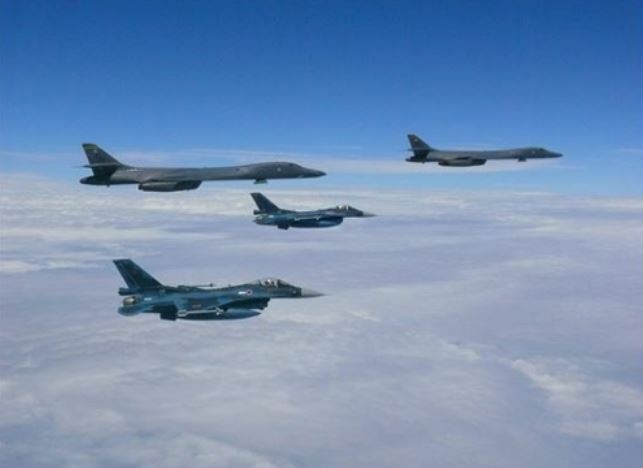 Two B-1B strategic bombers of the US Air Force trained with South Korea's fighter jets over the Korean Peninsula earlier this week in yet another show of force against North Korea, the allies said Wednesday. The bombers from Guam entered the Korean Air Defense Identification Zone at around 8:50 p.m. Tuesday, according to the South's Joint Chiefs of Staff. They staged a simulated air-to-ground missile firing drill with two F-15K fighters over the East Sea and flew across the peninsula, it said. The B-1Bs and the F-15Ks then had another firing exercise over the Yellow Sea. The bombers flew out of the KADIZ at around 11:30 p.m., the JCS added. A South Korean presidential official said that the training operation was part of the rotational deployment of US strategic military assets to the South. "The South and the US have agreed on the rotational deployment of (US) strategic assets," the Cheong Wa Dae official told reporters on customary condition of anonymity. "This operation was conducted against that backdrop." Under the agreement, such deployments will continue going forward, the official said. The US military confirmed the nighttime operation, saying the long-range, multi-mission supersonic bombers, also called Lancers, held similar drills with Japan's Air Force. The 7th Air Force described it a "sequenced bilateral mission" in the vicinity of Korea. It marked the first time that the Lancers had conducted a combined training exercise with South Korean and Japanese fighters at night, the unit stressed. "Flying and training at night with our allies in a safe, effective manner is an important capability shared between the US, Japan and the Republic of Korea and hones the tactical prowess of each nations’ aviators," said US Air Force Maj. Patrick Applegate of the 613th Air Operation Center. "This is a clear demonstration of our ability to conduct seamless operations with all of our allies anytime anywhere." South Korea said the B-1B's latest flight here was part of "regular deployment training" aimed at enhancing the capability to implement the "extended deterrence" against the North. The US military characterized it as a "continuous bomber presence mission" to demonstrate its combat readiness in the Indo-Asia-Pacific amid "unshakable alliance commitments" to safeguard regional security and stability. Late last month, the US flew B-1Bs over international waters close to the North's east coast in an independent nighttime operation.